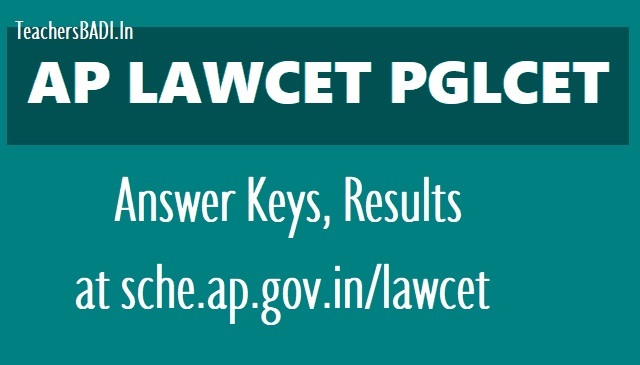 AP LAWCET PGLCET 2019: Answer Keys to be released soon at sche.ap.gov.in: AP LAWCET PGLCET 2019: Andhra Pradesh Law Common Entrance Test answer keys are likely to be released soon. Last year, the answer keys were released on April 25. All the candidates who had appeared for the examinations can check the answer keys through the official website, sche.ap.gov.in. The examinations were held on April .. for admission to LL.B/ LL.M programmes at various law institutes across the state of Andhra Pradesh. According to the APSCHE, the test is “designed to evaluate the candidate’s General Knowledge, Mental ability, Current Affairs and aptitude to pursue the study of Law”. Candidates had to answer 120 questions in 90 minutes. The answer keys for the AP LAWCET and AP PGLCET have been released by the Andhra Pradesh State Council of Higher Education (APSCHE) on the official website, the link for which is sche.ap.gov.in The AP LAWCET was conducted on April 19 for admission to the first year of 5-year LLB /3-year LLB. Further, the AP PGLCET is the entrance test conducted for first year of Postgraduate Law courses LLM/ML. The exam was conducted by Sri Krishnadevaraya University, Ananthapuramu, Andhra Pradesh at 16 different centres across Andhra Pradesh. The LAWCET paper was divided in three parts. Part 1 was for General Knowledge and Mental Ability, part 2 for Current Affairs and part 3 for Aptitude for the Study of Law. Parts 1 and 2 had a weightage of 30 marks while part 3 had a weightage of 60 marks. AP LAWCET PGLCET: The examinations were conducted to selects students for admission in 3 and 5 year LLB courses and postgraduate LLM law courses in various recognised institutions in the state. Promote your Website or Blog and increase traffic to your site.